I had been meaning to go to Buckland Thai, the restaurant in The Buckland Hotel in Alexandria, ever since I moved into the area, however with the multitude of restuarants around I had never made it. So when my friend from NZ and I were deciding where to go to dinner last night we decided to try it out. I’d emailed the restaurant a couple of months ago to find out if there were gluten free options and was told that there were a number. I was therefore a little confused when I got there to find out that the only gluten free option was the Pad Thai. 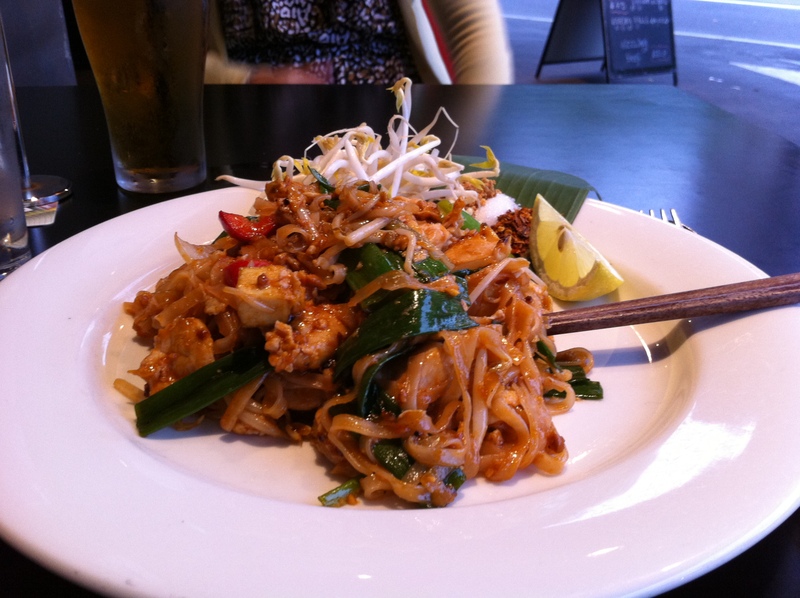 However this didn’t bother me as it made my choice easier and I also love Pad Thai, when it’s done properly! When I went to order there was no one at the restaurant till and I therefore queued up in the drinks line (which was rather long and there was only one bar staff on). After waiting for about five minutes someone came to the restuarant till so I ordered our meals. However I then had to get back into the drinks line as you can’t order drinks from the restaurant till. This was a bit annoying as it meant it took about 15 minutes to order the food and drinks. My meal arrived promptly, however my friends didn’t arrive until about 5 minutes later (she had ordered Pad Se IW so we were a bit confused as to why it was taking so long, in the end we had to ask the waitress). Luckily the meals were great! The Pad Thai was one of the best I have had, full of flavour (especially since I added all the chilli they had put on the side!). My friend also enjoyed her meal and we were both more than satisfied by the end. Do you get annoyed when meals come out quite far apart or do you expect it? I always feel bad to start eating when mine arrives first but then it goes cold if you don’t. And when you finish ages before the other person it’s always a bit annoying… I know that at some restaurants these days they will tell you when you order that the meals will come out at different times because of different cooking times and wanting them 100% fresh. I personally think they should just start cooking the quicker meals later!